I first wrote about conceptual illustrator James Clyne back in 2005, and then again in 2006 when he formed a collaborative studio with concept designer Feng Zhu as Gamma Ray Studios, which is no longer in operation. Since then, Clyne has extended his resume and added to his online project gallery with concept art for feature films like The Poseidon Adventure, X-Men 3: The Last Stand, Star Trek (image above, top, with detail, middle) and an underrated and undercirculated science fiction film called The Fountain (above, bottom). Clyne’s atmospheric, detailed and and imaginative concept images start with traditional media, markers and pens, rendered on vellum, and then move into digital applications like Photoshop for final renderings as digital paintings. There are 5 instructional DVD’s on the Gnomon Workshop in which Clyne details his techniques. As I also mentioned in a previous post, Clyne was an instructor for the Gnomon Workshop: Live! 2008 event. I think he is scheduled to be part of this year’s Gnomon Workshop Live! : 2009 event, which takes place in Hollywood on June 27 and 28, 2009, but I haven’t been able to confirm that yet. 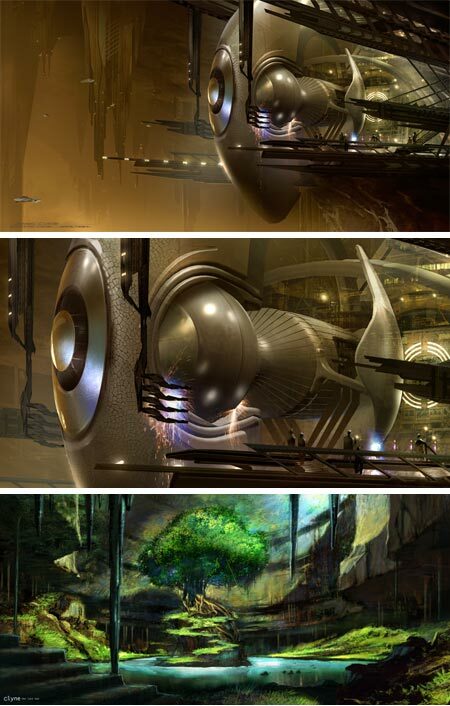 The io9 site has recently featured some additional galleries of Clyne’s work, with his designs for Star Trek, and several more general articles, including a collection of his Sweeping Vistas . Even though it can take a long (long) time for me to get to them, I do enjoy receiving recommendations about artists I might like from others. I particularly enjoy it when a painter whose work I admire takes the time to write me with a recommendation for a painter that he admires. Such was the case when Julian Merrow-Smith, whose work I have written about here and here, was kind enough to write and suggest the work of Marc Dalessio, who he had the chance to meet last year in Florence. Dalessio is a Los Angeles born artist, who lived in Fiji as a child, and for the last 17 years has been living and working in Florence, Italy (or more properly, Firenze – how the English made “Florence” out of “Firenze” I don’t know, but, I digress…). 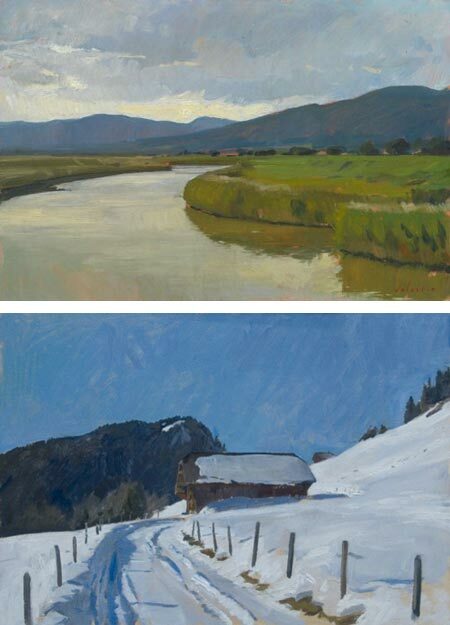 In addition to pursuing his own painting, Dalessio teaches small workshops in the summer and a course in plein air landscape at the Florence Academy of Art in the Spring. In the winters he takes group painting excursions to places like Kenya, Greece, India, Morocco, and recently, Myanmar. Dalessio excels at both figurative work and landscapes. As much as I like his strong, classically adept portraits, which simultaneously have both a modern feel and a late 19th Century sensibility, it is his landscapes that capture my attention. As in his portraits, Dalessio brings both a contemporary sensibility and a strong undercurrent of admiration for classical painters to his landscapes. He seems largely free, however, of accepting the conventions of particular strains of art, rather taking on only their spirit. Subjects that one would expect to find dealt with in a bright palette, a garden in Sicily, St. Mark’s Basilica in Venice, are instead approached in muted muted colors on an overcast day. His viewpoint shifts and searches, restlessly looking for a particular composition, which is seldom the one other artists might choose. There is a unique rhythm to his placement of light and dark areas, curves and geometries that defy the compositional choices one might expect from the subject. His use of color is understated, carefully controlled and always powerful. 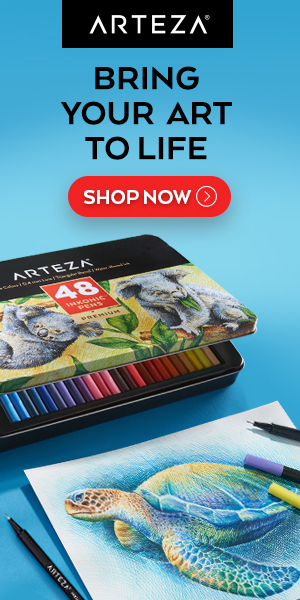 Dalessio discusses his supplies and his palette in posts on his web site, part of which serves as a blog, and part of which is a gallery of his work. There is an interview with Dalessio on Painting Perceptions. There is currently a show of Dalessio’s work at the Grenning Gallery through June 21, 2009. The gallery also represents him on an ongoing basis. The Grenning Gallery’s website, much to my mystification, does not seem to list the gallery’s location or give contact information. According to Google, they are apparently at 90 Main St, in Sag harbor, NY. Here is Dalessio’s post on the exhibit, which includes a link to a downloadable PDF catalog of the show. Jorge Colombo is a Portuguese artist living in the U.S. who has been getting much attention lately for this week’s cover of The New Yorker, which he “fingerpainted” on his iPhone using a painting application called “Brushes“. The app lets you record the painting process and play it back, and the New Yorker article linked above includes a time laps video of his process. I say “fingerpainted” because unlike other small mobile computing platforms, the iPhone and iPod touch is a touch-screen interface, meant to be used without a stylus, so your finger becomes the “brush”. This seems a little ungainly compared to stylus based small screen painting applicaitons, but the results indicate that you can do some interesting work with it. Colombo did his sketch in about an hour while standing outside Madame Tussaud’s Wax Museum in Times Square. 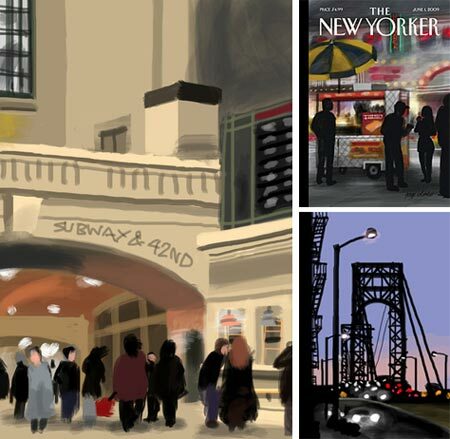 On Colombo’s web site you will find some of his iPhone sketches, along with other done in pencil and colored digitally. He is also offering prints of some of the iPhone work. In addition, there is a section of video and press coverage of his New Yorker iPhone sketch cover. 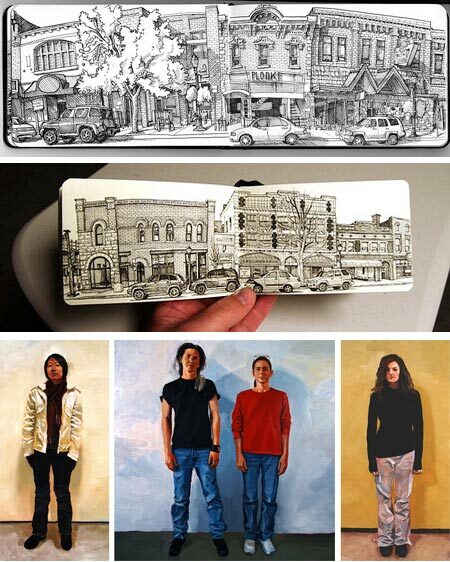 Inspired in part by Ed Ruscha’s photogrphic series of “Every Building on the Susnset Strip” and Matteo Pericoli’s panoramic drawings in his book Manhattan Unfurled, artist Paul Heaston decided to draw every building on Main Street in the historic district of his hometown of Bozeman Montana. Some of us who have never been to Bozeman think of it as a literary location, having been the setting for part of Robert Pirsig’s remarkable Zen in the Art of Motorcycle Maintenance, and a surprising number of other cultural references, including being the nominal location of the Star Trek: First Contact movie (co-written by Bozeman native Brannon Braga). It is also the site of Montana State University and is apparently rich with other colorful points of history. Heaston focused his interest in the historic architecture of Bozeman, the town’s Main Street, from Grand to Rouse Avenues, and as a challenge to himself, drew every building on every block in that area, on both sides of the street, from direct observation in his Moleskein sketchbook (which he apparently filled exactly, without intending to). The project started in October of 2008 and just wrapped up on May 10 of this year. It’s interesting to note that the seasons changed over the course of his project, giving it in interesting dimension of time as well as space. Heaston’s approach, is an immediate and direct drawing in pen (that I assume is a fine point marker like a Pigma Micorn or Staedtler, though I didn’t find a mention of drawing instrument), with a casual feeling, even while enjoying the portrayal of surface textures. He even seems to have a cavalier disregard for making his architectural lines straight. In some drawings, he winds up with what looks like curved perspective – like a photograph through a wide angle lens (which some have suggested is truer to the way we actually see than traditional “straight line” perspective). The casual feeling of his drawings brings to mind the sketchbooks of Robert Crumb and Chris Ware. I came across Heaston’s Bozeman Main Street Project on Urban Sketchers, where he is a correspondent. There is an article about the project, as well as one about its completion. The entire project is posted as a Flicker set. Heaston has a web site with galleries that include other drawings and graphics, as well as his oil paintings. The latter are largely a series of gestural, painterly standing portraits, that are informal both in composition and the sitter’s (stander’s?) attire. Heaston also maintains a blog, three letter word for art, on which you will find many other sketches and the stories behind them. 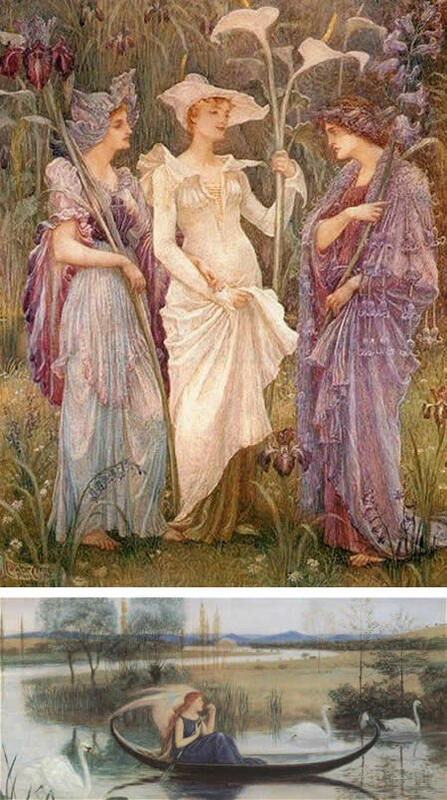 Walter Crane was one of the premiere English illustrators. He was active during the “Golden Age” of illustration, from the late 1800’s to the early 1900’s. Crane’s elegantly designed, deliberately retro illustrations for children’s books were influenced by his admiration for the work of Edward Byrne-Jones, and undoubtedly by the other Pre-Raphaelite painters, as well as by the Japanese prints that were favored in English and European society at the time. Crane in return was also influential, both on his fellow illustrators, and on the wider Arts & Crafts Movement, with which he was integrally involved, having founded the Arts & Crafts Exhibition Society in 1888. Crane was also a designer for textiles and wallpapers, and created gallery art, much in watercolor, and was an associate in the Water Colour Society. His book illustrations range from graphically designed book pages, somewhat in the vein of Howard Pyle’s self-authored tales, to a more fully rendered style akin to his compatriot Arthur Rackham; though the artist who most often springs to mind for me in comparison is Edmund Dulac. One of the best resources for Crane is the ArtMagick site, which has a bio and several pages of images. Wikimedia has quite a few book pages. You can read his entire illustrated Baby’s Own Aesop on MythFoklore.net, and a much shorter Beauty and the Beast on Bedtime Stories. Fontcraft has a font called Walter Crane, developed from examples of his hand lettering. There are a number of books available with his illustrations and ornamentation. UK artist John Harris began painting at the age of 14 and entered Luton College of Art at 16. His interest in space, and the portrayal of the scale of large objects and distances, led him to illustration work in the science fiction and fantasy field. He was influenced in his early paintings by the English Victorian painter John Martin, who painted large scale canvasses of large scale scenes, often dramatic depictions of Biblical disasters. Over time, Harris moved away from the tightly painted Victorian style into the looser, more painterly and texture rich style he now employs. He also moved away from his early experiments with techniques involving gouache and shellac inks, which, though they produced interesting effects, proved to be impermanent and fragile. In addition to his work in publishing and advertising, his paintings are in the collections of NASA and the Smithsonian as well as numerous private collections. Harris has a skill for using texture and color to suggest, where others might paint detail. His atmospheric otherworldly landscapes and space scenes are created from fields of multi colored and richly textured areas that in small sections might seem abstract in intent, but resolve in the eye into the feeling of more detail than is actually present (somewhat akin to the approach of John Berkey). Harris revels in the feeling of monumental scale and often offsets his structures with suggestions of small figures. 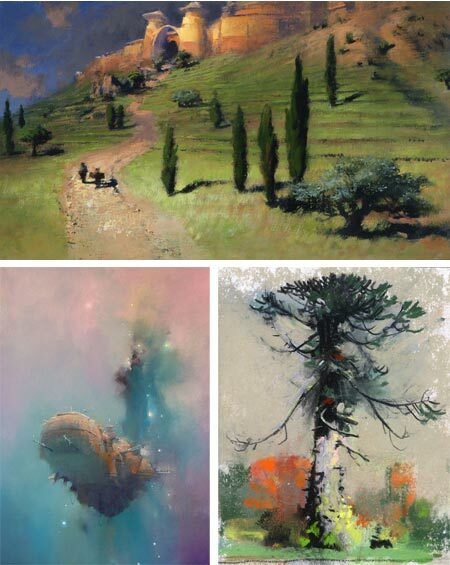 Harris also paints traditional landscapes, though perhaps a bit non-traditional in that his personal vision often lends itself to slightly other-worldly choices of color and atmospherics. There is a collection of his work titled Mass: The Art Of John Harris.